Many hikers that I know also have some sense of adventure and so are happy to look for somewhere with a bit of climb in the hike. Now we are talking about easy climbs that require no special climbing equipment or skills are are really more of a scramble than a climb. 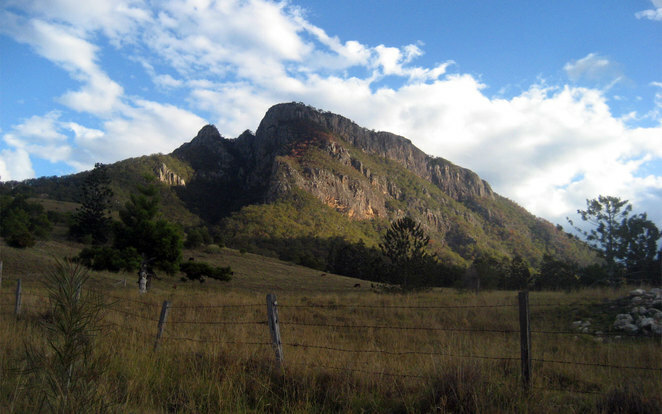 Note: I have deliberately left off some of the more difficult but famous climbs such as Peasants Ridge at Mt Barney or Tibrogargan in the Glass House Mountains. This article is going to focus on the easier hikes and climbs, though some do require a good level of fitness. 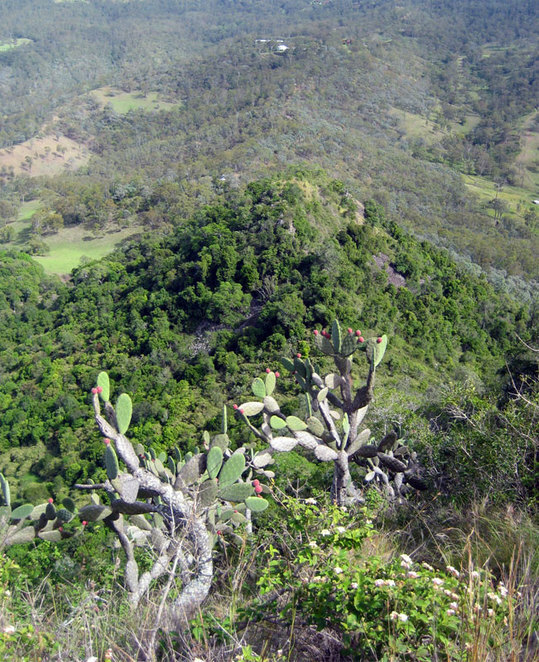 Table Top mountain is the hike to do to see if you are going to enjoy a climb with your hike. 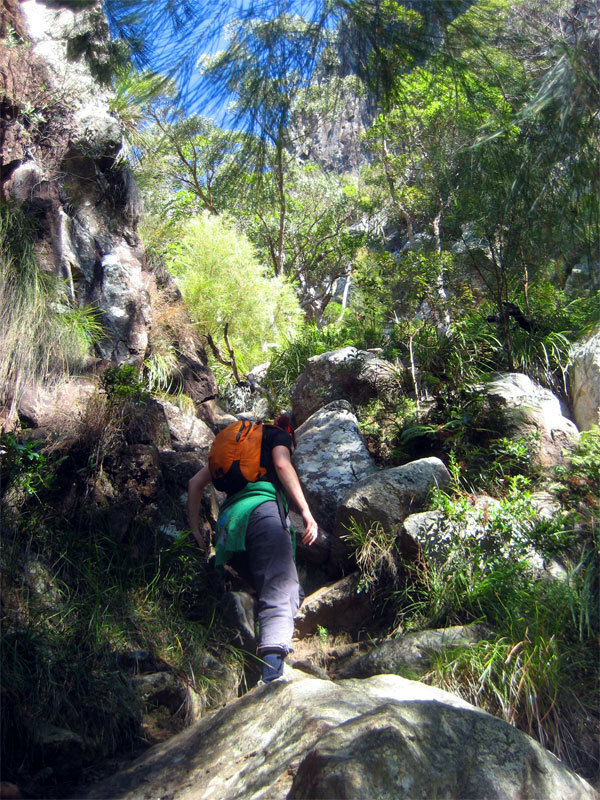 Much of the trail involves hopping over rocks, a bit of scrambling and there is one section that requires scrambling up a near vertical wall. Nothing particular hard about this hike and Toowoomba locals will run past you as you make your way up and down the cliff. The view from the top makes it worth the effort. 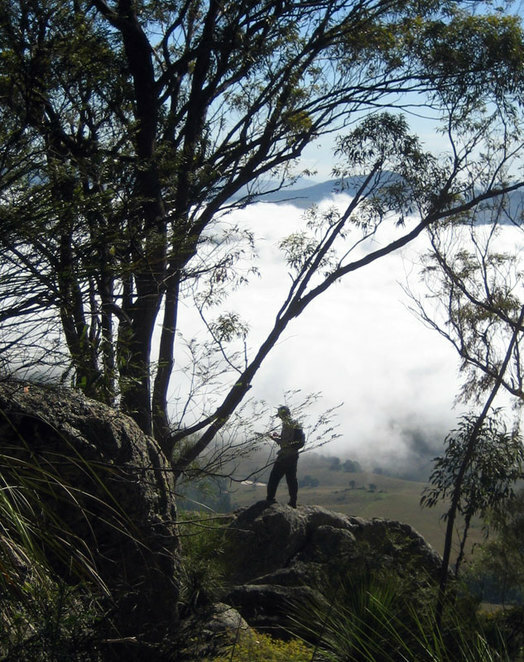 The treeless plateau of the summit is a nice place to walk around for views down the Lockyer valley before heading back down. 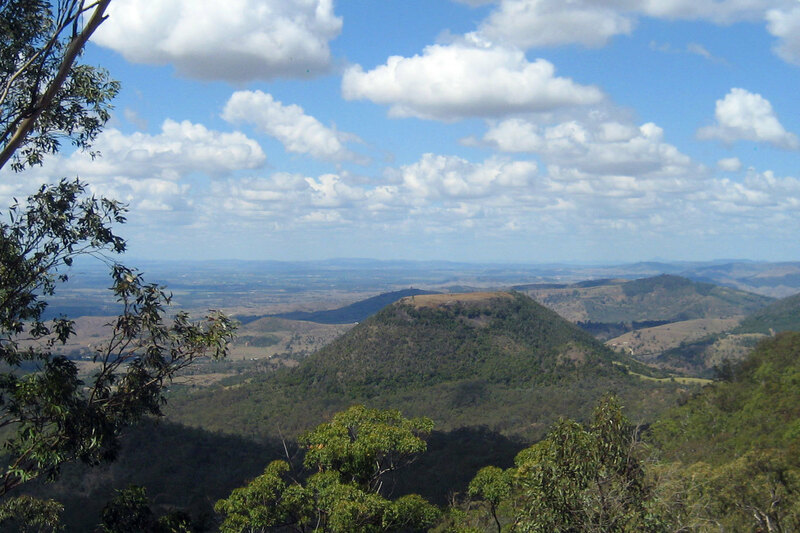 This is a short fun little hike that can be incorporated into a trip to Toowoomba and surrounds. Not a difficult or dangerous hike if you take your time and don't rush. Mt Warning in Northern New South Wales is the climb that is on nearly everyone's bucket list, especially the night climb to see the sunrise. This is by far the longest climb on the list but it is made much easier by the chain and footholds cut into the rock. Mostly people can finish the walk to the summit in about 2 hours, but you want to give yourself plenty of time as the walking part involves heading uphill most of the way even before you come to the climb. 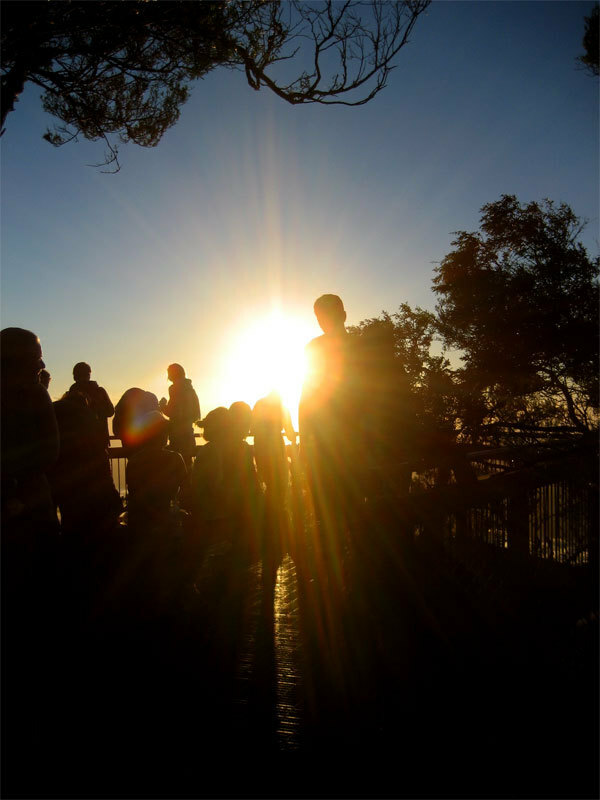 If you are walking up in the late afternoon, watch the time or at least bring a flashlight with you. The view from the top, especially at sunrise makes this worth the effort. My tip is to walk up to the start up the climb before first light, and then do the climb with the pre-dawn light with plenty of time to see the sunrise. 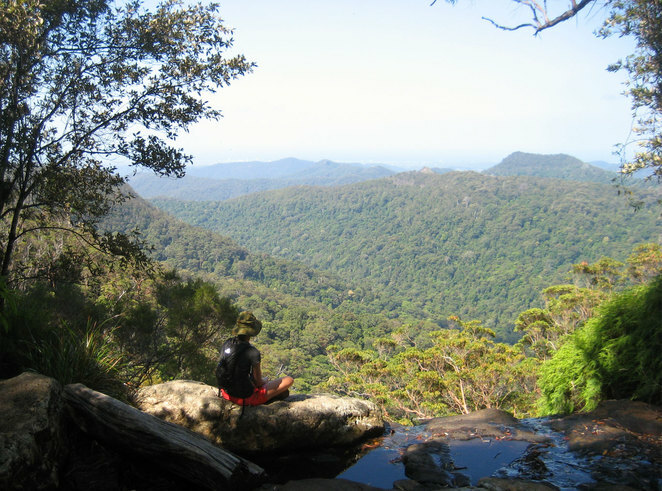 The lovely little climb up The Pinnacle at the end of an unmarked bush trail is a fun scramble to see great views of Springbrook national park. Finding the start of the unmarked part of the walk is not that difficult. 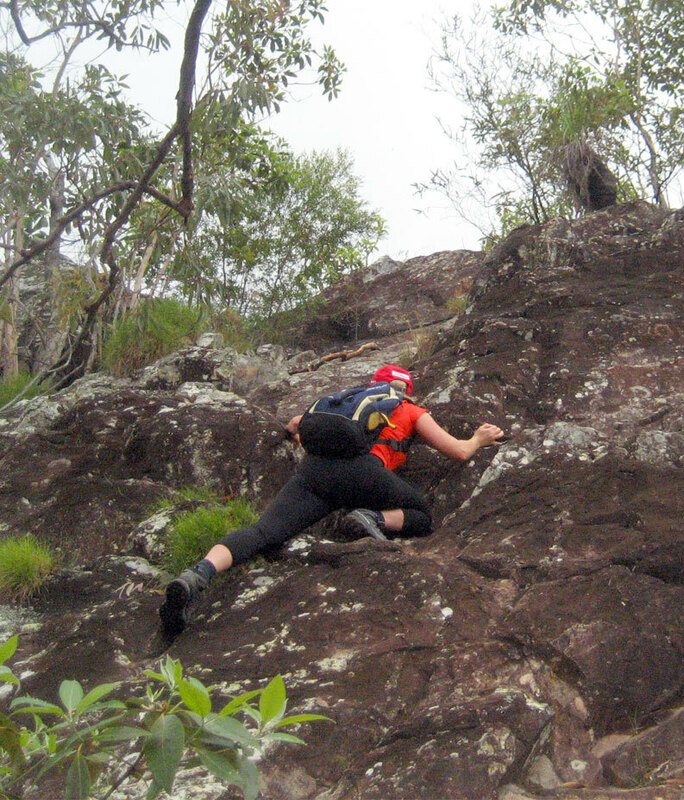 There is a big switchback on the Warrie Circuit track, and this is the track to The Pinnacle starts. You might consider buying topographic maps of the area or downloading them for free from QTopo. 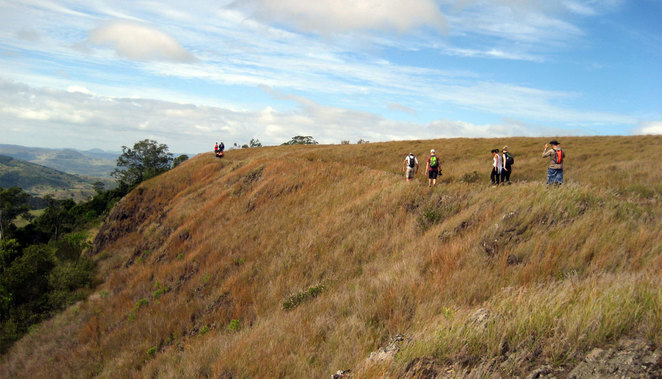 The track is easy enough to follow as it is on the top of a gently sloping ridge. If you start going downhill, then you are off the track. There are also plenty of trail markers left by hiking groups, though when we did it we ran into someone who had lost the trail and was backtracking. . The top of the Pinnacle is not particularly difficult, though the sandy soil means you should test every hand and foot hold on the way up and down. There is also only limited space at the top as well, so if you go with a large group you will have to take turns. If you do this walk as part of the 17 km Warrie Circuit, it will add another 4 kms to the walk. If you just want to do the Pinnacle then walk the Warrie Circuit in a counterclockwise manner then back track the way you came. But this will mean you miss out on the best parts of the Warrie Circuit. The 6 km return hike up and down Mt Maroon took us 5 hours, though the National Parks guidelines suggest giving yourself 6 hours. 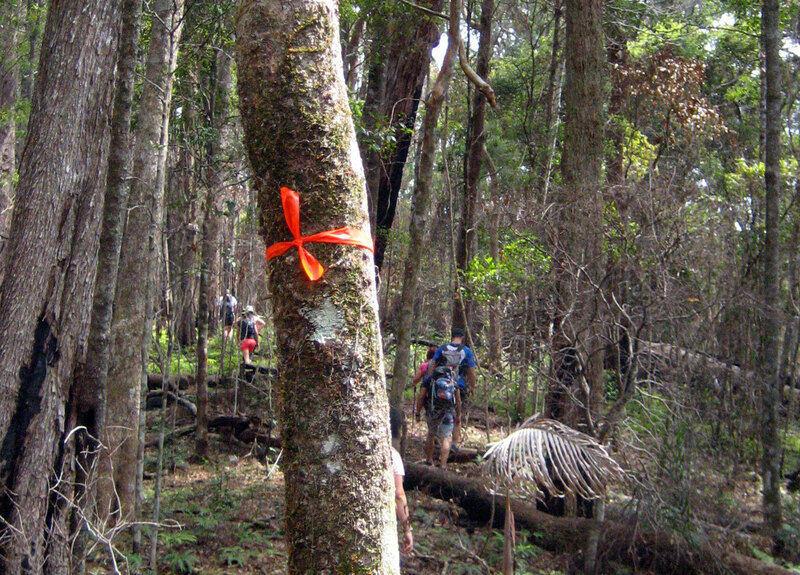 We were going fairly slow and very fit hikers will complete it in around 3 hours. 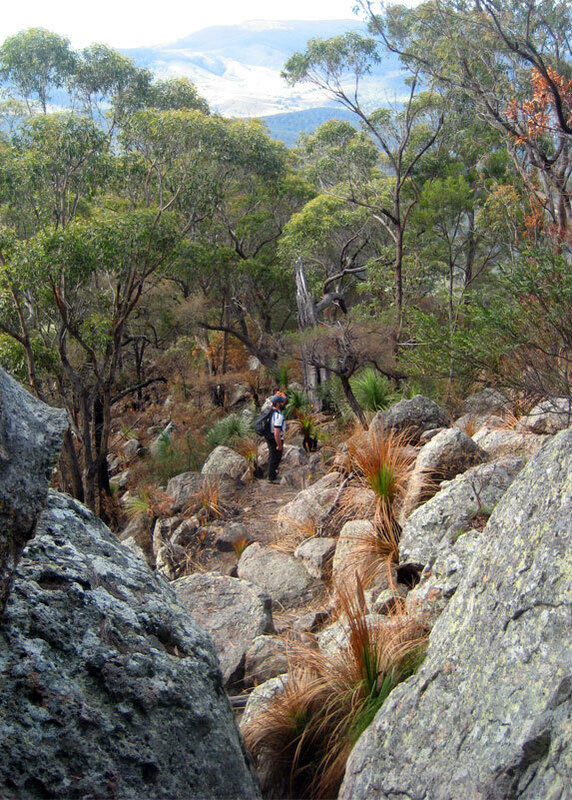 The walking part of is steep and goes along very rough trails, and there is some climbing when you go up the gorge and at the top. The gorge that you scramble up can seem fairly steep and difficult at first glance, however it really is not a challenge. There is one section shorter people might need a hand up, but other than that, it is fairly straight forward. Whatever you do, don't attempt the gorge while it is raining as it funnels the run off water and becomes very dangerous. At the top, the track becomes less defined, but basically you get to the top of the gorge and turn left and make your way up the various rocky sections to the very top for amazing views of the surrounding area. For this hike you will need a fairly good level of fitness, but it is not dangerous if you take you time and don't rush. Also the steepest section is fairly enclosed so you don't have too much of a problem with vertigo. 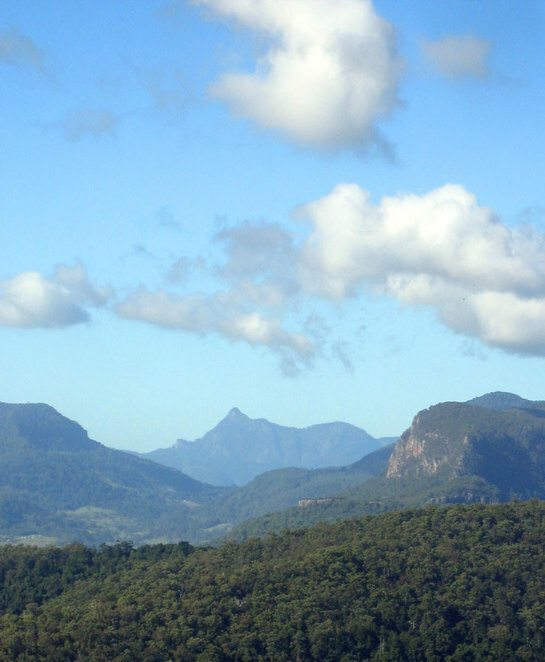 Most people who visit the Glass House Mountains wonder if they can climb any of the hills. 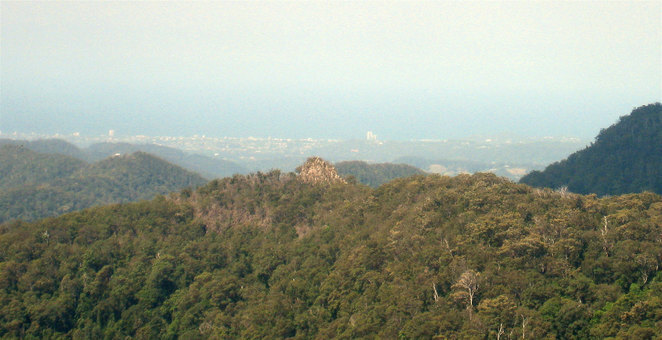 Excluding Beerwah and Coonowrin which are closed, all the hills have tracks to the top. 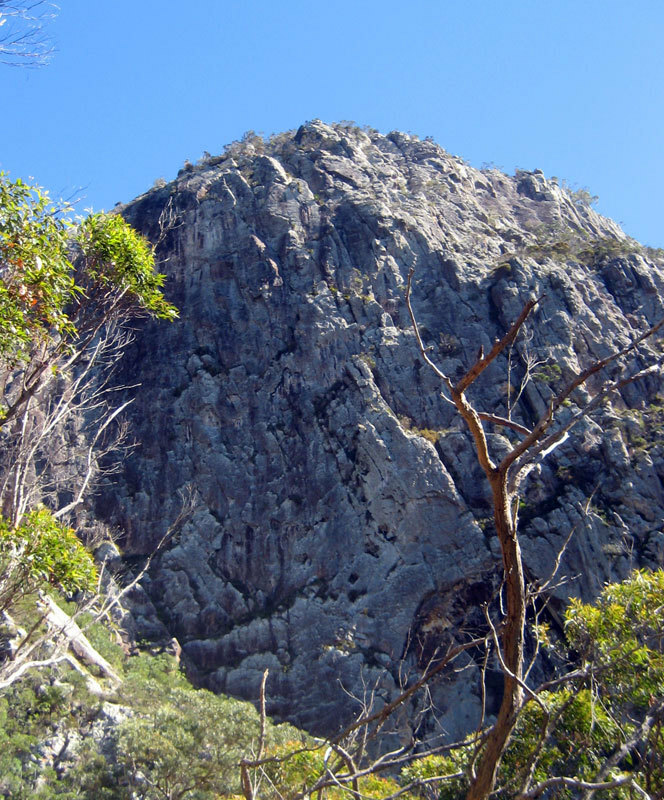 Tibrogargan is the one that attracts the most attention but it involves a long and difficult scramble up a steep rocky face. However the most interesting of the remaining hills is Tibberoowuccum. There are two challenges to hiking the 220 m high Tibberoowuccum. The first and most difficult is finding the start of the track. You start at the Trachyte Walking Circuit car park on Marchs Road (not the one off Barrs Road). Then walk along Marshs Road in the direction away from Tibrogargan (roughly westerly) for about 100 metres. You will see a fire trail to your left. Walk up this fire trail for 300 or 400 metres until you see a small pile or rocks on your left. 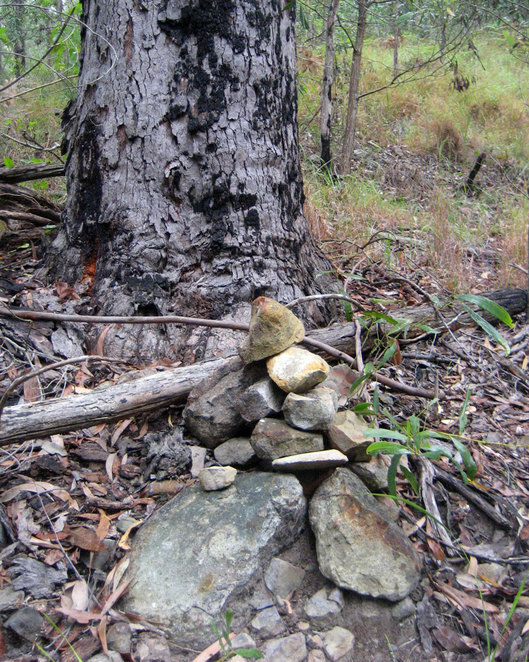 This pile has been left by hikers to mark the start of the trail up Tibberoowuccum. Once you have the track, it is easy enough to follow up to the top. Then you turn left and follow the ridge until you come to the bottom of Tibberoowuccum's rock dome. Climbing this dome is not difficult though it can look a little daunting. 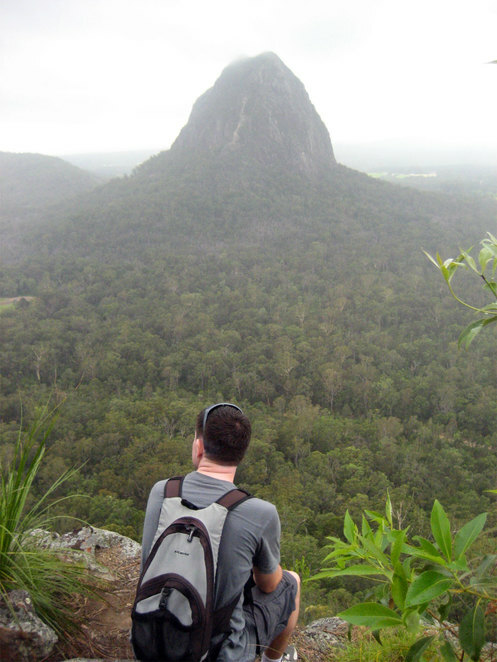 The top of the rock dome provides 360 degree views of the glass house mountains and is well worth the walk. When going back down you can retrace your steps or look for a path on your left that goes back down. Both paths rejoin the fire trail.